Pesticide-free use Sasanishiki 100% used, It is a natural fermented lactic acid bacterium powder that adapts to the intestines of the Japanese people. Prepare the best rice for lactic acid bacteria and cultivation environment. "Bringing closer to fungus" It is born with its own recipe. You can completely digest food, Absorb nutrition from blood, To the body which can promptly excrete waste matter. "Natural fermented lactobacillus" is a powdery, palatable powder like powder snow. There is no smell or habit, soft lactic acid bacteria taste. It is a delicious taste that only makes it every day, from children to elderly people. Using only the best rice and koji, water as the raw material, Lactic acid bacteria and yeast made long-term spontaneously fermented in a severe low temperature environment. I am freeze-drying while living them. First of all, please drink the powder as it is. Lactic acid bacteria and yeasts are gradually dissolving in the stomach, You can realize that you start working fine. Natural fermented lactobacillus of the Ueda family. Please use on a healthy everyday. I will enter the body without a burden It is chemical sensitivity and it reacts to vinyl covering rice, but this powder goes into the body without a burden. Good condition of your skin It was constipation for decades. Even though I drank anything, I did not feel refreshed, but it changed in about a week. Every day, it feels nice, your skin is in good condition. The bad coldness improved. It seems that my blood flow has improved, I feel that bad coldness has improved better than before. Does the amount of hair increase? Bowel movements were improved, and assistance during the night was reduced In a nursing home, I am taking advantage of sweet sake using "natural fermented lactic acid bacteria" to occupants. Bowel movements have been improved, assistance during the night has been reduced, and the site is also saved. Taste that can be used for various dishes I bought it by being recommended by a friend. 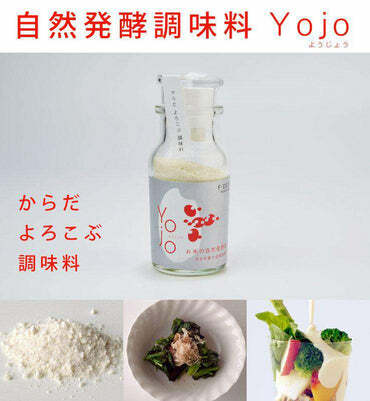 I am using it for soymilk yogurt making. Even if it is put in miso soup, it does not disturb the taste, so it can be used for various dishes. I'd like to try various things. My stomach condition is very good When you drink 3 capsules a day, your stomach condition is very good. Also, if you made bread, the skin bald and the inside got dirty, with little sugar you made a slightly sweet bread. Easy to eat and tasty It tasted slightly sweet and tasted slightly sweet, it was very easy to eat and it was delicious. I taste made from rice. The side effects of medicine will be lightened Since I was young, I have a cold intractable illness. The side effects of the medicine you are drinking will be lightened. Suddenly feeling entering the body Suddenly, it felt like entering the body. I feel that I am more suitable for myself than those of milk ingredients. Tasteless, lactic acid bacteria taste. It looks like everyday is delicious. ※ For food, there are no rules, Children (Elementary school student or less) Up to 1 capsule per day, To see 1 to 3 adults per day for adults. Recommended after eating. It promotes digestion of rice. Choice of your choice (crepe, plum, green laver, sesame, salt etc. Fry the material), it is more delicious. If it is a miso where the fungus lived, it remains as it is. Plus, it increases lactic acid bacteria power. Even without adding sugar, it becomes easy to drink. Smooth absorption of antioxidants of fruits and vegetables. Together with salt, soak powder To the fridge. Little bit, to pickles of elegant lactic acid bacteria. Melt in eggs and bake. Fluffy, to light finish. Even if vegetable oil is used, buttery flavor appears. 1 pack in a branch floor, mix, and go to the refrigerator. With the effect of lactic acid bacteria, the smell disappears? ! It will be pickled with pickles flavor. 【What to prepare】 Soy milk (no ingredients adjusted) 350 cc Natural fermented lactic acid bacteria of the Ueda family ... 1 package (g) Screw type lidded bottle (450 ml) 【How to grow】 1. In a boiled disinfected bottle, add "Natural fermented lactic acid bacteria" and 1 teaspoon of water and mix with a spoon. (Lactobacilli will get up!) Pour soy milk into 2.1 and mix. Close the lid tightly. 3. Place in refrigerator (vegetable compartment 7 ~ 10 ℃). 4. After 4 to 4 days the mash will start. Rinse the bottle. 5. When you start to solidify loose, you should eat it. ※ Please be sure to save in the refrigerator and please eat as soon as possible. ※ The number of days will vary depending on soymilk and refrigeration temperature. The Ueda family has over 10,000 students for 10 years I greeted a course of natural fermentation. Among them, those who suffer from bad bowel indigestion and indigestion, How much? Improvement of intestinal flora, Allergies, obesity, diabetes, cancer and depression etc. It is attracting attention as a state-of-the-art medical treatment to cure modern diseases. Why is natural fermentation lactobacillus good for intestine? And using only water as a raw material It is made by long-term natural fermentation in a severe low temperature environment. Growing at low temperature makes bacteria less prone to live, Wild fungi that survived in harsh environments will live together and work together. In this production method, colonies coexisting with lactic acid bacteria and yeast (lactococcus / multipolar budding yeast / extracellular polysaccharide) are born. This colony is the form of lactic acid bacteria, familiar to the intestines of the Japanese people. In the Ueda family, by long-term research, by controlling bacteria by natural selection, We succeeded in stabilizing natural fermentation. (Patent pending) It was freeze-dried while living lactic acid bacteria colonies (symbiotic) living It is natural fermented lactobacillus of the Ueda family. Weda family 'natural fermented lactic acid bacteria' It is a manufacturing process of "nestling closely with bacteria" in the natural world. Natural fermented food research laboratory at COBO Lab.Yokohama We prepare by the hand of the Ueda family and are fermented spontaneously. · Prepare Yamagata pesticide-free pesticide 100% and natural cultivated brown rice koji. · Steaming of rice is related to the growth balance of bacteria. I will check to see if the fire evenly passes. · Bottle cold rice with brown rice koji and water. · Natural fermented food research institute Natural fermentation exceeding 30 days in a special refrigerator room. The bacteria are eliminated and lactic acid bacteria resistant to low temperature are bred. There is little influence of mold and chemical substances, The environment where lactic acid bacteria are easy to grow is important. · Daily, by tasting the state of bacteria Confirming. If the balance collapses even a little As quality deteriorates, fermentation progresses and danger is involved, It is important to thoroughly "snuggle with bacteria". · Once lactic acid bacteria and yeast's flora (colony) are completed, I put it on a strainer. Less burden on fungus than hand I understood that. · Freezing with our own freezing method to reduce the load of bacteria. · Send to a consignee, freeze-dried (freeze-dried). Small burden on mycelia, time and effort spent We are implementing our own freeze-dried recipe. · (It is often added to freeze-dried products) Do not add dextrin or oligosaccharides at all, It is a completely non-additive food that uses only raw material "rice, rice koji". · It is shipped after crushing and sealing work. "Natural fermented lactic acid bacteria" will pass to everyone's hands. Avoid using high temperature and humidity, you can use it deliciously for 2 years. Natural fermentation is "fermentation that does not add acid or yeast". Climate vegetables, cereals, beans etc. Put it in a cold period, stick to the material, Miscellaneous fungal environment inhabiting the environment It is important to go through the process of natural selection. First, lactic acid bacteria resistant to low temperature grew I can suppress germs. Next, when the yeast proliferates Make amino acids and alcohol, there Acetic acid bacteria grow and ferment. Natural fungus relays are the only It is natural fermentation. The COBO Ueda family is from the fruits, vegetables, cereals, legumes of the Japanese culture, I have been doing natural fermentation research. Based on that experience, we will sustain natural fermentation for the longest time, Variety of flavor and taste from one material I feel that it is rice to bring forth. Japanese people are aware of what is suppressed by rice again. With the establishment of "natural fermentation system" and patent application, Not only ourselves, but also this lactobacillus yeast, I would like to serve the people I am looking for. To the body, I'd like you to take it in the table. That's what I thought in 2011. I met Katayama representative of the revolutionary field of fermentation brewing industry "Katayama main store". Mr. Katayama was making a "rice-glut" market that is not alcohol. We debuted freeze dry powder "Miggurt who is living in Ueda family". As a complete non-additive spontaneous fermented food, even now, it has received reverberation. April 2005. To improve the "quality" of further bacteria Established COBO Lab.Yokohama. We created the best (refrigerated / frozen) environment for fungus in Yokohama City. Here, you can realize "a manufacturing method that is close to the fungus". COBO Lab.Yokohama "natural fermented lactic acid bacteria", the power of lactic acid bacteria that can preserve bacteria is further strengthened and evolved as a health food. I improve the taste on a daily basis.